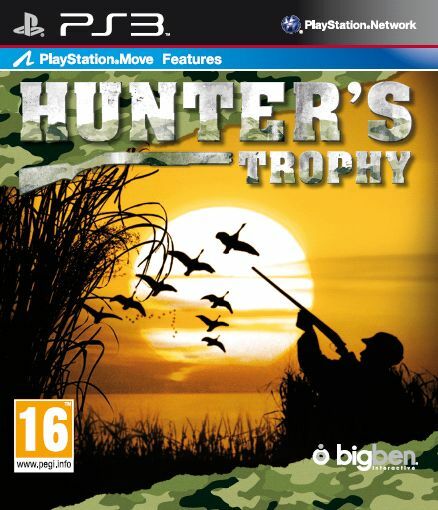 Hunter’s Trophy is a game where players can live out the life of a regular hunter, using real world hunting regulations and the motion control of the Playstation Move. The game comes with a plastic gun to outfit with both the Move and Navigational controller. Players create profiles and semi-customise their hunters and go into a Career as a hunter, go for a Quick Hunt or get some practice at the shooting range. However, is it really the perfect hunting simulation or should it be one of the targets of the shooting range? In Hunter’s Trophy, the player will live out the opportunity to hunt for different types of game, whether they are small or large. Players can choose to hunt in swamps, plains and forest. The game captures the sport of hunting very well. One must go at a slow pace, find clues and draw out their game. Hunters will be given a pack of dogs to help draw out their game. Each hunt has a quota and will count towards a final score, which takes into account accuracy and penalty shots among others. In essence, it captures the realistic world of hunting and I applaud this game for doing that. Packaged with the game is orange and grey plastic gun. It is divided into two parts: the barrel and the stock/grip. The gun itself feels like a gun or what a gun would feel like, I imagine. It is quite sturdy but there will be a slight off balance of weight due to the Move being right at the end of the gun. Inserting the Navigation controller mimics loading a shotgun with its shells, signalling a readiness to hunt some game. The gun is fine as it is, although it is quite strange that the stock/grip is coloured orange instead of brown. There are three modes of play for the player to choose from. One of these modes of play is Quick Hunt. 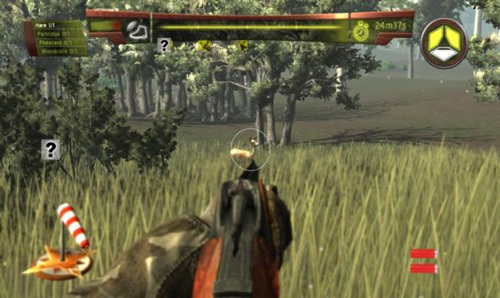 In Quick Hunt, the player chooses their hunting ground, their time of day and what type of game they want to hunt before proceeding to the customisation screen. Once that is done, then it is time to hunt some game. This is a great option for those who want to just play for a short amount of time. It is also great practice for Career Mode. The game also features a Career Mode. 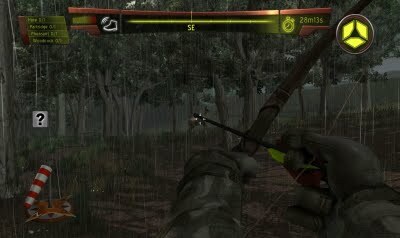 In Career Mode, the player is tasked to go through a set number of hunting grounds and completing challenges, usually meeting a quota of animals as specified in the player’s hunting plan. For example, the plan may ask for the player to hunt for a boar and a deer. If the player over indulges on their quota, they will be penalised, as well as shooting protected animals, such as females and children. Shooting pests, like foxes, however, will actually increase the player’s score at the end of the hunt. This can be compared to an online leaderboard, but it only shows surrounding players, not the top players, which is quite questionable. Why would it be restrictive with the leaderboards? The third mode of Hunter’s Trophy is called the Shooting Range. In here, players can practice their shooting skills in three types of practice modes: trap, target and silhouette shooting. Players play for points as well as increase their familiarity of the gun attachment. This is also the only mode where multiple players can actually join in. However, it is not adding a second player via a second Move. It is passing the gun to the next player. It is alright if one wants to practice without the game or want to add that second player. Yes, there is no online co-op play or any online multiplayer, which could have worked in a game like this. The game does offer customisation, although it is pretty limited. The player can choose their gender, their clothing and weapon of choice when they do go out for a hunt. That is all they can choose. Most of these items are in fact locked at the beginning, so that bow one wants has to be unlocked through Career Mode. To be honest, this feels like a let down. The game should have facial and body customisation, allowing the player to shape their hunter as they would like. In addition, with the Playstation Eye, the camera should have captured the face of the player and morph it into a face of the hunter. Further clothing options and some form of customisation for the weapons could have added to the individuality of each hunter. Alas, one can only wish for these things. The game offers two control methods: regular controls and Playstation Move. If I had to recommend one of these schemes, then it would have to be the regular control. I am not against motion controls in gaming, however, the motion control here are below average compared to other games. More often than not the Move is quite inaccurate, which leads to frustrating moments and missing what could have been the killing blow. The calibration is fine, it is just the cursor does not match where the Move is being pointed to. I believe this was designed with the mindset that the Eye should be right in the middle of the screen. It is also a tad bit too sensitive when the Move it’s turned to face another direction. This is quite awkward when the player manoeuvres around the hunting ground. The visuals are quite bad, to put it bluntly. Character and animal models have minimal detail and the environments are quite ugly to look at. I was not expecting a grand, realistic environment, but it could have looked better. The colours are quite muted where they should have shined. Animations are not bad, but there is one that raises my eyebrows. After collecting the dead game, the hunter simply walks to it and collects it like it is something to put in one’s pocket. Considering that the game is quite big for a space that small, why does it simply pick it up and put it in its pocket? I’m sure something else, like hanging it by the hunter’s side, would have been better. This is a game where realism is hammered to the player, but the visuals are anything but. The audio is limited mostly to the menus, with decent orchestral music playing in the back ground. The sound effects during the hunt all match up with their respective purpose, so all is alright in the audio department. Hunter’s Trophy is great for the hunting enthusiasts but for no one else. The game barely offers anything in terms of gameplay and still manages to create a somewhat frustrating experience if one wants to use the Playstation Move. The visuals are very bad but the audio seems to be decent, with good use of the ambiance of the environment. One might have fun with the game but that fun will dwindle after a certain period of time. Couple that with constant spelling mistakes in a time where people are paid to make sure every word is spelt right and one has a mediocre experience that should be only picked up by those who love the sport of hunting.